Oh boy, do I have a doozy for you today! Hmm, is doozy even a word? But first! Remember to check out my Shepherd’s Pie recipe for a chance to win a month’s worth of Creamer potatoes from The Little Potato Company! Now, just a heads up, cooking time varies on the thickness of your mushrooms. I prefer thinner portobello mushrooms usually, but for these pizzas, I did not mind a thicker cut. I bet this recipe would work well on the BBQ, too. Come the nicer weather, do not be surprised if you see a BBQ version of these pizzas! Pizza sauce (I used my homemade recipe.) or store-bought. Parmesan cheese, omit for vegan recipe. Mix the olive oil, vinegar, garlic, chili flakes, salt, and pepper in a large Ziploc bag. Toss in the mushrooms and allow to marinade for a couple of hours minimum. Preheat oven to 375F. Place a cookie cooling rack on top of a baking sheet. Place mushroom caps stem side down. We want to cook the mushrooms like this to drain any excess moisture out first. Place into oven and bake for 10 minutes. Remove from oven and turn right-size up. Add spinach, pizza sauce, and cheese. Place back into the oven and cook for another 5-10 minutes, or until cheese is nice and melted, and mushrooms are cooked perfectly. Ahh, I hate writing up blog posts after cooking a recipe like this one because I begin to drool and wish I had more of the amazing food! Sigh, such torture. 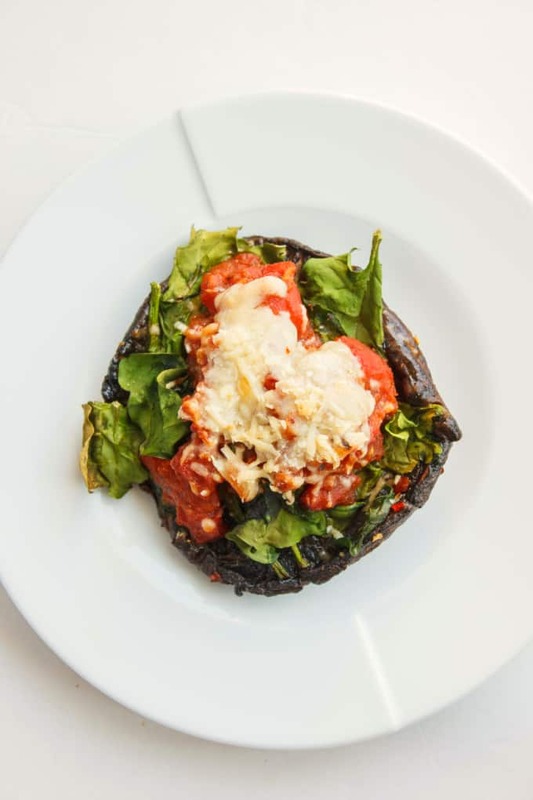 But since they are so easy to make, I am sure these portobello mushroom pizzas will be on our menu again soon. These sounds so delicious! I want some for lunch! This looks like a fabulous recipe! I love portobellos and I know I'd love it in pizza form! 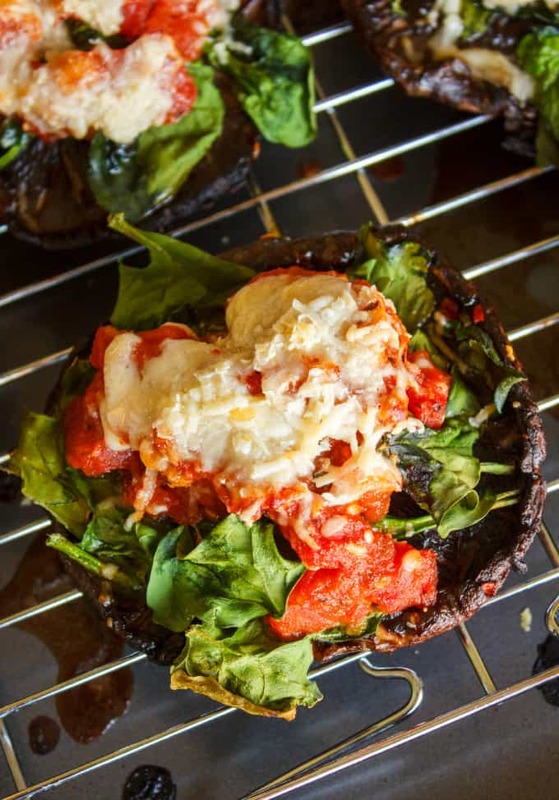 This is such a creative idea to use mushrooms instead of a tradition crust! And I think you are right I think they would be perfect on the grill! As soon as the nice weather hits, I am getting these onto the BBQ! 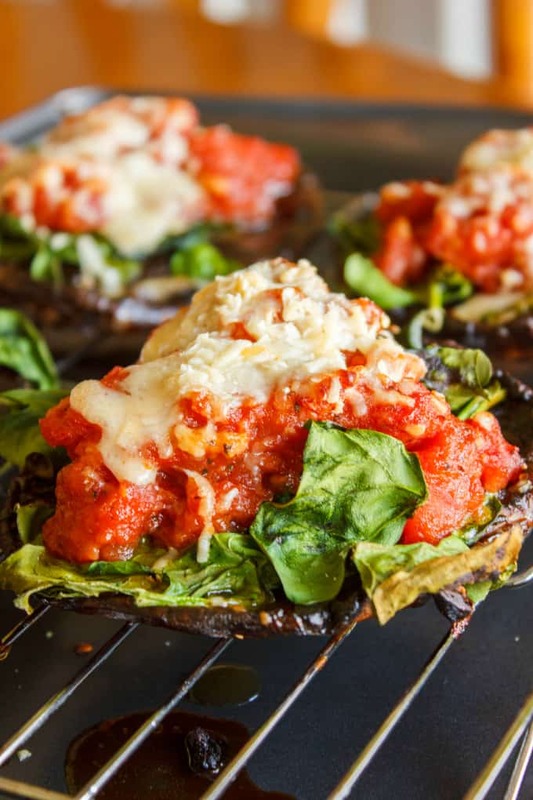 I'm a fan of mushrooms and pizza so I'm going to really love this recipe. It's so easy. Can't wait to give this a try. I just need to get some mushrooms. Loving the marinade element here! 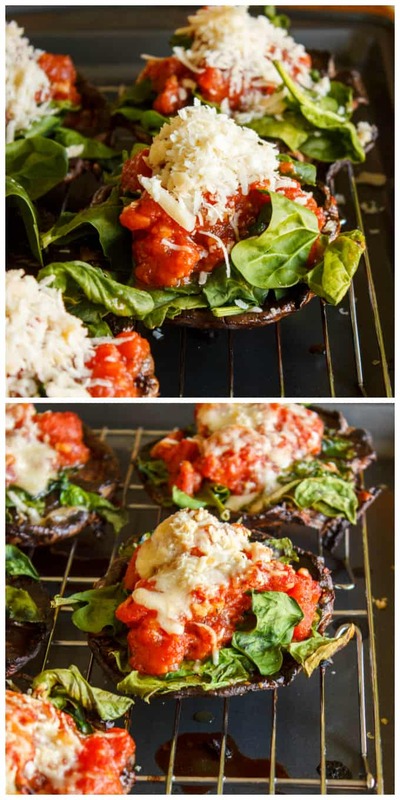 I love stuffed portobello mushrooms! These look AMAZING! These look very nutritious! Portobello mushrooms are one of our favorites! They are very healthy and can easily be adapted to suit anyone's dietary needs. I love meals like this with no grains. I could eat those "pizzas" every week and never complain! I found myself eating almost all of them to myself... But they are so healthy and delicious, who could pass up on that chance?! So perfect! And Paleo if I omit the cheese! I haven't researched a lot into Paleo, but glad that my recipes fits into the category! Gorgeous pictures - drooling over here too ;) I'm trying to watch my carbs and these look like the perfect alternative to pizza! As much as I love pizza crust I love mushrooms ever more! This is one delicious looking dish...yum! I love both as well, so satisfies all cravings! This is such a perfect vegetarian recipe for me to make for my family. I love how it's a healthy and nutrition take on a pizza.. whilst still being really delicious!